The Chimer (literally, the People of the North), also called the Changed Folk, Velothi, or Changed Ones, were the Aldmeri tribes of dissidents who abandoned the ways of Summerset Isle and embarked on a great exodus to Morrowind. They followed the prophet Veloth, who spoke to them on behalf of Boethiah, Prince of Plots, and two other "Good Daedra". The teachings of Veloth and the Daedra spawned a new culture on Tamriel and a new people, sparking the period of the High Velothi culture. They were dynamic, ambitious, long-lived Elven clans devoted to fundamentalist ancestor worship. They appeared like other elves, but their skin was a darker shade of pale gold than the Altmer. 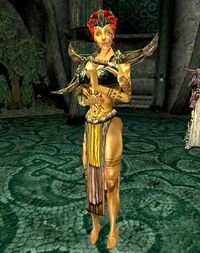 Almalexia of the Tribunal apparently maintained her appearance as a Chimer (as did Vivec, partially) despite the Curse which changed the Chimer into the Dunmer. The history of the Chimer begins with the Velothi dissident movement in the Summerset Isle. Some sources seem to differ on when exactly this happened. Some say it took place in the Late Middle Merethic Era, and others trace it back to the Dawn Era. One source says it took place before the shattering of Lorkhan, and another says that it was after Topal the Pilot and others had explored mainland Tamriel. Trinimac, strongest of the Altmeri ancestor spirits, fought enemies of Altmeri society both without and within. As such, Trinimac and his followers became engaged in trying to halt the Velothi dissident movement. Boethiah, the "Devourer of Trinimac", took exception to the "lies" Trinimac had been spreading about Lorkhan. He tricked Trinimac, ate him, assumed his form, and the dung he excreted became Malacath. The followers of Boethiah and Trinimac rubbed this excrement on themselves to change their skins. It was the followers of Boethiah (i.e, the followers of Veloth) who became the Chimer. Altmeri propaganda portrayed this as a lesson on the dangers of Velothi influence, while Velothi propaganda regarded Trinimac's transformation as punishment for attempting to interfere with their exodus. Malacath himself derided this narrative as being too "literal-minded" (implying the essence of the story, while metaphorical, is somewhat accurate). So, the Chimer departed. They credited the Good Daedra with teaching them the principles of their new way of life. 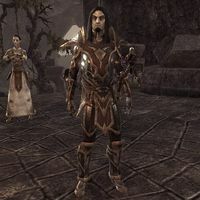 Worship of Aedra such as Akatosh, disappeared from their legends. They typically associate most of the things they learned with Boethiah, but Mephala is credited with teaching them the ways of evasion and assassination, and Azura with teaching them how to be different from the Altmer. The Good Daedra also warned the Chimer of the "Bad Daedra", such as Molag Bal, who sought to spoil Chimeri "purity". In their new homeland, which they called Resdayn, they quickly came into conflict with the Nedes, Orcs and the Dwemer. With the Dwemer, especially, territorial disputes combined with religious animosity created a great deal of conflict. Historians blame the Chimer for provoking these conflicts. Regardless of who started it, the Chimer were generally on the losing end of these conflicts. Though they wielded great magic and had fine warriors, the Chimer were a small group, and the Dwemer had an incredible technological advantage. The Late Merethic Era saw the precipitous decline of Velothi culture. Some Chimer settled in villages near declining and abandoned ancient Velothi towers. During this period, Velothi high culture disappeared on the island of Vvardenfell. The earliest Dwemer Freehold colonies date from this period, suggesting they were created to secure Dwemeri lands from Chimeri incursions. Degenerate Velothi devolved into tribal cultures which, in time, evolved into the modern Great Houses of Morrowind, or persisted as the barbarian Ashlanders. Around 1E 240, the Nords under High King Vrage conquered Resdayn, making it part of the First Empire of the Nords. The Nords' use of the thu'um against the Chimer made them practically unstoppable, although some blame the god Sai for favoring the Nords. They would remain under the Nords' heel until around 1E 416, when they joined forces with the Dwemer to repulse the invaders. The friendship between Chimer leader Nerevar and the Dwemer leader Dumac forged the basis for an alliance between the races under the First Council, leading to almost three hundred years of peace. Eventually, a dispute over the Dwemer's discovery, the Heart of Lorkhan, led to the War of the First Council, which culminated in the Battle of Red Mountain. A few years later, the betrayal of an oath by the Tribunal led to the Curse: the Chimer's skin turned black as ash, and their eyes became red. The Chimer ceased to exist, and the days of the Dunmer began. Sources sometimes refer to the Chimer as the Dunmer in events dated before the Battle of Red Mountain, before the Dunmer actually existed. One of the masterpieces of the great artist Cherim depicted Veloth leading the Chimer into Morrowind. The term "Velothi" can be used to refer to any followers of Veloth. However, by the Third Era, it was also often used to refer to former Ashlanders who had abandoned their nomadic lives in favor of the Great Houses of Morrowind.